This property is best suited for up to 8 adults or 2 families of 4 adults and up to 6 children. We spared no expense when we renovated our lake home with top of the line finishes and beautiful furnishings to make your stay away from home comfortable and relaxing. Bedrooms consist of mattresses & bedding that are less than a year old. Bdrm #1 has a Queen Bed, TV and sliding glass door to the lake/backyard (sleeps 2). Bdrm #2 has a Queen Bed w/full-sized futon & upper bunk twin bed (sleeps 4-5) & TV. Bdrm #4 has a Queen Bed (sleeps 2) & TV. All bedrooms have brand new TV's equipped with either cable or apple TV, Roku and Netflix. If you are inclined to cook up delicious meals, our newly remodeled kitchen is fully equipped with anything you need. Sofa table folds out for an additional 3 people. We have a Keurig & DeLonghi Nespresso coffee makers as well as a regular coffee maker, electric griddle, waffle maker, toaster, microwave oven and all the cookware, dishes & utensils you may need. Central A/C & gas forced heat. Family room boasts of double sliders allowing a grand view of Big Fish Lake. Enjoy the game on the brand new 60" TV that has cable, Apple TV and Netflix. Living room has wood-burning fireplace (wood not included). Enjoy your meals outdoors and insect free in our lakeside screened patio room with a beautiful vaulted pine ceiling. Dining table seats 6-8 and 4-8 for lounging by the gas fire pit. The patio room is perfect for late night drinks and poker/board games away from pesky mosquitos. Speaking of mosquitos, our property is treated for mosquitos all summer long. Don't feel like cooking? No problem! Walk to The Rock for a gourmet meal either indoors or al fresco. Enjoy roasting marshmallows around the backyard fire pit (firewood not provided). Front covered deck boasts of 2 loveseats and a chair that comfortably seats 5. Our lakeside deck overlooks the back yard and is perfect for a game of bean bag-toss (not included). Large front yard for additional activities such as wiffle ball, baseball, badminton, soccer, volleyball, football, etc. The kids love the cute Amish built playhouse that has a sleeping loft and couch. This lake is a hidden gem with low boat traffic. Fishing right from the pier is one of the best spots on the lake to fish. The lake is stocked with large and small mouth bass, walleye, northern pike, dogfish, perch, bluegill and crappies. Sandy bottom shallow entry into lake from the steps off the pier. Pier has space available to dock your own boat. No boat? No Problem! Call Apollo Marine to rent a boat. They will deliver and pick up for your convenience. Use of our paddleboat and paddleboard are free with rental contract and hold-harmless agreement. Several golf courses and a driving range in the area. Horseback riding, winery tours and road biking. Plenty of restaurants and entertainment in Marcellus/Lawton/Paw Paw (pubs, restaurants, movies, bowling, ice cream shops, antique shops). There are small mom and pop grocery stores like Wagoners in Lawton, grocery chains like Giant in Paw Paw. Visit the brand new Wal-Mart in Paw Paw for...well, anything. Our kids love to take a walk or ride down to the end of the lake to visit the 3 mini-horses. We are a 10 min drive from Swiss Valley ski resort and 40 min from Timber Ridge Ski Resort with a tubing park. Enjoy ice skating and ice fishing right outside the door on our lake and if that's not your thing, there are several wineries nearby that would love you to swing by for a tasting, open year round. Our home is a 2-hour drive from downtown Chicago (unless you leave during Friday rush , approximately one hour to Notre Dame/South Bend, 15 minutes to Paw Paw, 30 minutes to Western Michigan University and Kalamazoo. Our home is well equipped, clean and kid friendly. We have a good assortment of kid and adult games that we leave up year round. Pets allowed on a case by case basis. No smoking in house, please. We are a family of 4 who resides in the city of Chicago and have been enjoying our Big Fish getaway since 2008. We’ve spent 2 maternity leaves at BFL & have watched our kids grow up here where they have learned to swim, fish, wake surf and water & snow ski, among other things. 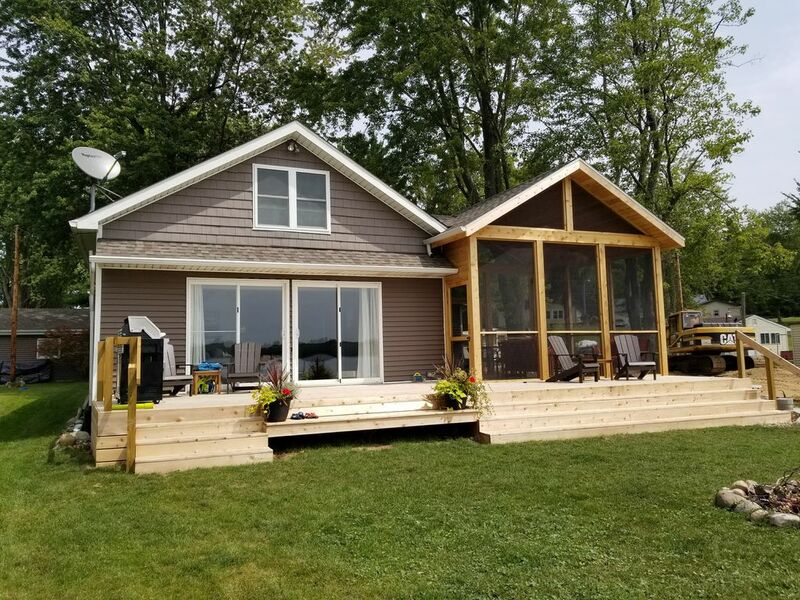 We had a lot of fun renovating the house over the last year and a half and converting it from an old school cottage to a modern lake front oasis where we truly escape the concrete jungle to enjoy our home away from home. Some of our most cherished memories have been made at Big Fish Lake and we know you will truly cherish your time here also. Thanks for stopping by!! Water Skiing, Wake Boarding, Wake Surfing, Fireworks, Swimming, Jet Skiing, Biking, Sunbathing, Fishing, Kayaking, Snowmobiling, Snow Skiing, Snowboarding, Entertaining and just relaxing at the lake. Lakeside Deck overlooks large grass yard with fire-pit on Big Fish Lake. Some basic seasonings, sugar, flour, etc. Dining table seats 8, island seats 4, sofa table expands for 3. Large screen TV in living room and new TVs in every bedroom. All are Netflix compatible. Cable TV in living room and 2 bedrooms. Adult and kid board games available. We have two small children so we have toys for kids age 8 and younger. Also a secret hideout under the stairs. Our home has 2 large grass yards in both front and back. Boats available to rent from Apollo Marine. (2) Front Covered Porch and Lakeside Deck. Lakeside deck has 4 wood Adirondack chairs. We have a paddleboard and paddle boat available to our renters. Extremely well appointed and recently refurbished location with amazing touches. Most comfortable beds I’ve slept in at a vacation home. Highly recommend this location. Wish we would have been there in the summer to enjoy the lake but the area fall colors were a special treat. So glad you enjoyed it! Definitely come back during the summer to enjoy the water! ! Nicely renovated, very comfortable cottage. Enjoyed our peaceful, restful week here. We had 15 people and this home was PERFECT for us! Such a beautiful home and lake. We had so much fun the entire week! Central location and owners were very easy to work with. We had a great time in the beautiful home. It had everything we needed for a great vacation. Owner great to work with, lake had great fishing, lake was not busy, able to enjoy swimming and boating! The house was very clean and comfortable. The beds were very comfortable and plenty of room for everyone. We enjoyed both decks, the gazebo and firepit. The kitchen was well equipped and all linens provided other than beach towels. The only drawback for us was that the lake was weedy for swimming. Overall, this is a very nice home and property and we enjoyed our stay. Weekly rentals only during high season.